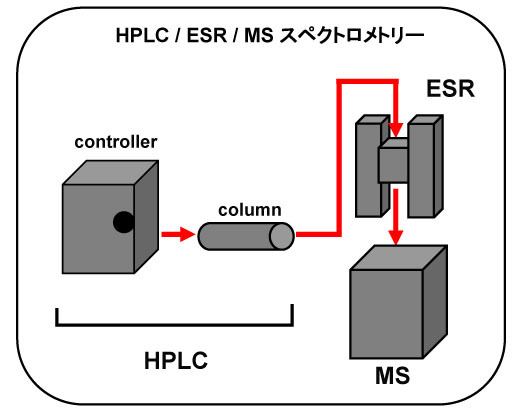 Detection of the reduced forms of radical adducts on the ESR trace using HPLC-electrochemical detector-ultraviolet absorption detector-electron spin resonance-MS.
Hideyuki Ikeda and Hideo Iwahashi, J. Sep. Sci. 2010, 33: 1185-1191. Identification of Radicals Formed in the Reaction Mixture of Bovine Kidney Microsomes with NADPH. Kazumasa Kumamoto, Tomihiro Hirai, Shiroh Kishioka, Hideo Iwahashi, J Biochem, 2009, 146: 571-579. Identification of a Radical Formed in the Reaction Mixtures of Ram Seminal Vesicle Microsomes with Arachidonic Acid Using High Performance Liquid Chromatography-Electron Spin Resonance Spectrometry and High Performance Liquid Chromatography-Electron Spin Resonance-Mass Spectrometry. Katsuyuki Minakata and Hideo Iwahashi, J Clin Biochem Nutr. 2010, 46: 135-139. Caffeic Acid Inhibits the Formation of 1-Hydroxyethyl Radical in the Reaction Mixture of Rat Liver Microsomes with Ethanol Partly through Its Metal Chelating. Hideyuki Ikeda, Yuka Kimura, Miho Masaki and Hideo Iwahashi, J Clin Biochem Nutr. 2011, 48, 187-193. Formation of 7-carboxyheptyl radical induced by singlet oxigen in the reaction mixture of oleic acid, riboflavin and ferrous ion under the UVA irradiation. Hiroko Mori and Hideo Iwahashi, J Clin Biochem Nutr. 2011, 49: 141-146. 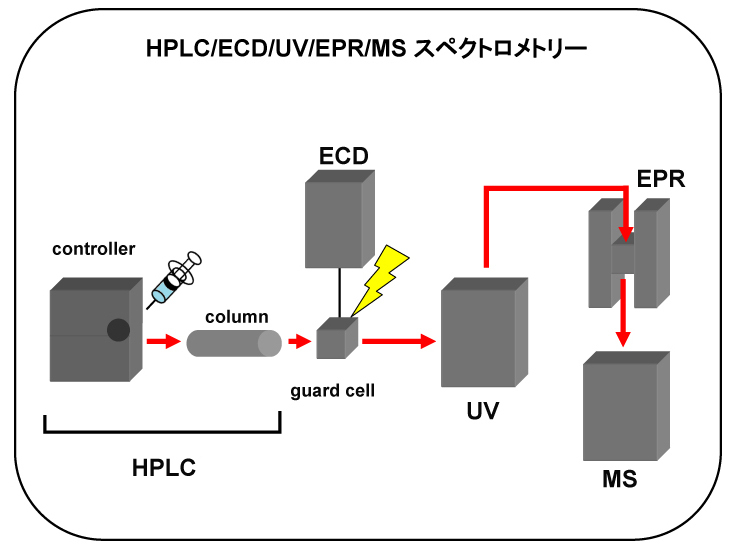 Identification of the radicals formed in the reactions of some endogenous photosensitizers with oleic acid under the UVA irradiation. Hiroko Mori and Hideo Iwahashi, J. Clin. Biochem. Nutr. 2012, 51: 170-177. Detection and identification of 1-methylethyl and methyl radicals generated by irradiating tea tree (Melaleuca alternifolia) oil with visible light (436 nm) in the presence of flavin mononucleotide and ferrous ion. 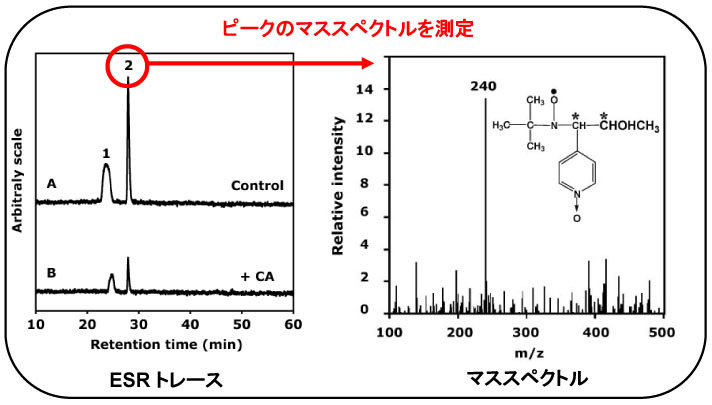 H.-M. Mori and H. Iwahashi, Free Radical Research 2013, 47: 657?663. Caffeic acid inhibits the formation of 7-carboxyheptyl radicals from oleic acid under flavin mononucleotide photosensitization by scavenging singlet oxygen and quenching the excited state of flavin mononucleotide. Marie Asano and Hideo Iwahashi, Molecules 2014, 19: 12486-12499. Baicalin inhibits the Fenton reaction by enhancing electron transfer from Fe2+ to dissolved oxygen. Daisuke Nishizaki, Hideo Iwahashi, American Journal of Chinese Medicine 2015, 42: 87-101. 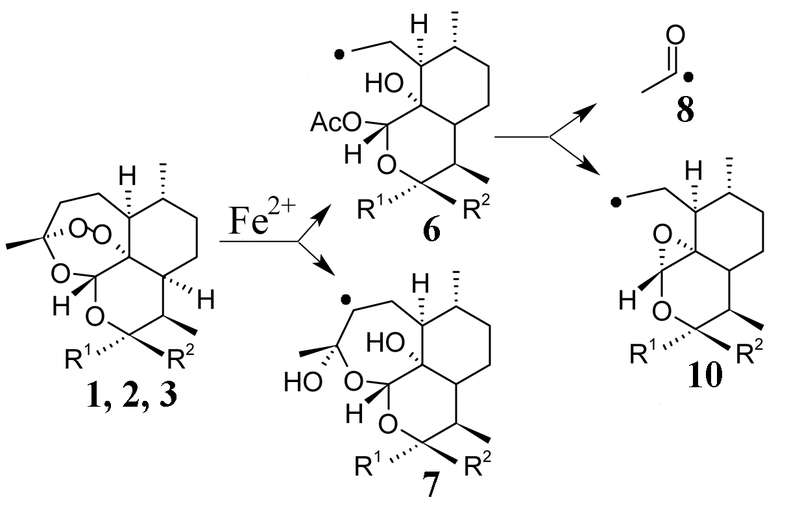 Determination of the structures of radicals formed in the reaction of antimalarial drug artemisinin with ferrous ions. Marie Asano and Hideo Iwahashi, European Journal of Medicinal Chemistry 2017, 127: 740-747. 1+1 Complex of guanine quartet with alkali metal cations detected by electrospray ionization mass spectrometry. Kazuaki Fukushima and Hideo Iwahashi, Chem Commun. 2000, 895-896. 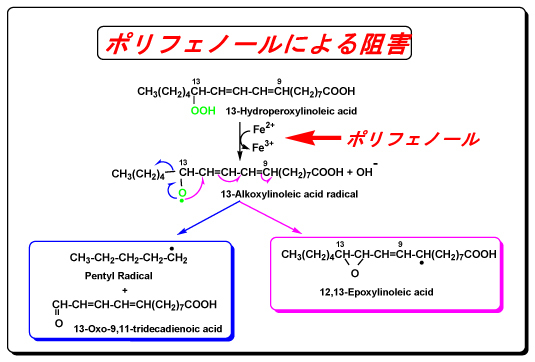 A comparative study of the inhibitory effects by caffeic acid, catechins and their related compounds on the generation of radicals in the reaction mixture of linoleic acid with iron ions. Yuji Matsui, Yoshie Tanaka and Hideo Iwahashi, J. Clin. Biochem. Nutr. 2017, 60: 162-168. Copyright (C)2000-2011 Wakayama Medical University, All Right Reserved.